The ISO 45001 standard specifies requirements for an occupational health and safety (OH&S) management system that allows organizations to control OH&S risks and improve performance. It does not state specific OH&S performance criteria, nor does it give detailed specifications for the design of a management system. Achieve the standard. 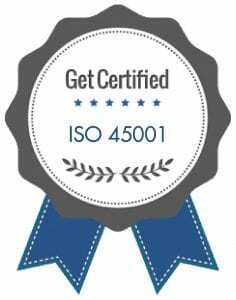 Get ISO 45001 Certification today. Control risk and improve performance with ISO 45001 certification from QSR. There have been a number of significant changes to the document since the first edition was published in 1999. The changes reflect the widespread use and experience of the standard in more than 80 countries and by approximately 16,000 certified organizations, according to drafters. There is now a much greater emphasis on “health” rather than just “safety,” and significantly improved alignment with the ISO 14001 standard on environmental management systems to promote the concept of integrated management systems. Why Get ISO 45001 Certification? Get ISO 45001:2018 Certification today. The importance of “health” has been emphasized. ISO 45001:2018 is now referred to as a standard rather than simply a specification, or document, as in the earlier edition. This reflects the increasing adoption of ISO 45001:2018 as the basis for national standards on occupational health and safety management systems. The “Plan-Do-Check-Act” model diagram is only presented in its entirety in the Introduction. The previous edition had also presented it in sectional diagrams at the start of each major clause. Reference publications in Clause 2 have been limited to purely international documents. New definitions have been added and existing definitions revised. Significant improvement in alignment with ISO 14001:2004 has been made throughout the standard; as well as improved compatibility with ISO 9001:2000. A new requirement has been introduced for the consideration of the hierarchy of controls as part of OH&S planning. Management of change is now addressed more explicitly. A new clause on the “Evaluation of compliance” has been introduced, consistent with ISO 14001:2004. New requirements have been introduced for participation and consultation. New requirements have been introduced for the investigation of incidents. Discover how ISO 14001 can enhance your business, and the best way for you to obtain this highly regarded certification. Maintaining the certification, continuous improvement, and increased performance are easily achieved With our superior customer support at QSR. Achieve the standard. Get OHSAS 18001 Certification today.